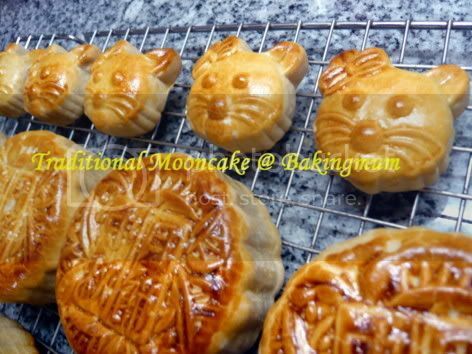 Actually after baking the mooncakes, you got to wait for a few days for the oil to come out and the skin becomes softer so that the moonies will taste better. But the boys couldn't wait and ate a few of my hello kitty moonies at one go. You can see the cut-up moonies and the pastry is still a little dry as it was freshly baked. Your mooncakes look so good, me "lau nua liao". The hello kitty mold ones are very cute! Can't blaim them for not waiting or being unable to resist! Hehe..
Nice mooncake n i m from eastern part of Singapore. May I have your Takoyaki recipe? I did try Aunty Yochana's traditional mooncake, but the mooncake did not hold their shape well. The dough is sticky to handle. 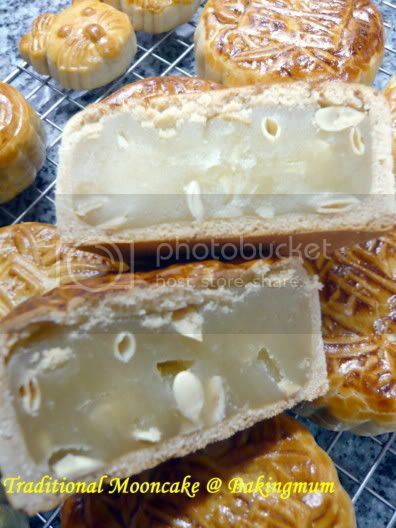 After managing to put it into the mould & then to unmould the mooncake, the side pattern often becomes blur. After baking, it becomes slanted n the design is often unclear. Can u tell me should the dough be sticky in the first place after resting for an hour? 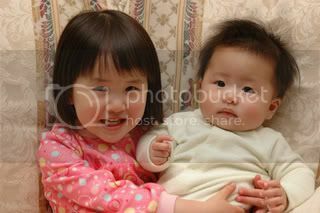 I am soo amaze with all the moonies I see!!! What beatiful yummy looking moonies!!! Which I can make them!!! Drool! Drool! Droool!! Ching, you not making any this year? Hi Josephine, I live in the East also. How come stop at only two types of cake. Try to experiment with others. For all you know you will be able to bake it just as well. BBerry, I will need some time to put the recipe of the Takoyaki up. But it will be done. Hi Madeline, the dough is slightly sticky. Rest it for more than 1 hr uncovered. Flour the table before rolling out the dough. Wrap and bake in a preheated oven at 200C. If you follow exactly the recipe, you should not have a problem. One tip for you is that you can chill the paste before wrapping. Ie, after weighing the paste, shape it into a ball. Chill it in fridge for an hour or so. 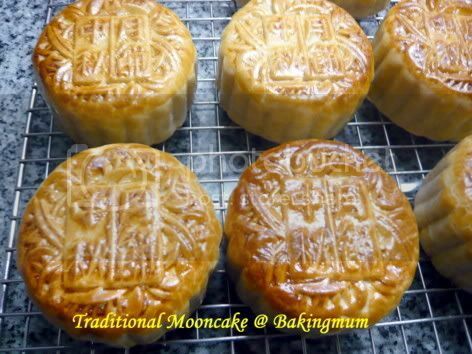 It will help in the shaping of your mooncake. i m not good in decor the cake n dun knw wat to put inside the cake n my kids like tat 2 cakes, tat's y....i always wanted to learn baking cake. may i knw where did you learn your skill fm?? btw, do u knw wat is buttermilk?? how to DIY it n wat is regular milk? I haven't made any mooncake! I saw how Lily Ng made the lotus seeds filling, I kepala pusing already. Don't think I want to experiment with it this year. Josephine, I learned from a few places, like CC, PH, Creative Culinaire, etc. Sometimes just from recipe books too. You can make your own buttermilk by adding 1 tbsp of vinegar to 1 cup of milk and let is rest for 10 to 15 mins. Hi Lee Lee, hv tried yr non-bake version char siew last saturday. My family enjoy veri much.